Management Effectiveness | Lewis Associates, Inc.
As with living organisms, growth and aging of organizations are primarily driven by the relationship between two factors: flexibility and controllability. When organizations are young, they are very flexible; but they are not always controllable. 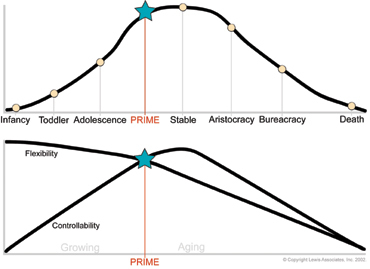 As organizations age, the relationships change; controllability increases and flexibility decreases. When an organization is both flexible and controllable, it can change direction and make that change occur as desired. The organization can control what it wants to do. This stage, Prime, has the advantages of both youth and maturity. This then is the objective of management, to lead the organization to arrive and stay at Prime. Only people can be made to appreciate in value -- by making them more productive. Each person can learn how to get more done, with lower stress, using these powerful, personal management tools and techniques. During this workshop, participants are introduced to a new way of approaching time and personal performance. Each person learns how to increase output in every area of life. The process deals with both the practice and the psychology of time management. Top managers are those who can create an environment where peak performance takes place. This requires simultaneously putting all the known motivators in place while removing the demotivators that inhibit performance. The very best organizations are far more productive and profitable than average organizations in the same industry. These organizations are characterized as "a great place to work." They are also characterized as "high trust" environments, where people feel terrific about themselves and their work. The manager's ability to delegate effectively to others is the key to leverage and multiplying the manager's value to the company. Delegation is one of the most important skills of management. Without the ability to delegate effectively and well, it is impossible to move up or to advance in management to higher positions of responsibility. Knowledge, technology and competition are increasing today at an ever intensifying rate. To survive and thrive in a fast-changing world, managers and organizations must out-team, out-think and out-perform their competitors -- every single day. Excellence in Management provides the ideas, methods, strategies and techniques used by all highly effective managers, profitable businesses and world-class teams. The subject of individual motivation, why people do the things they do, has been studied and researched for many years. Understanding how and why people perform and behave the way they do is essential for managerial effectiveness. Every person is different, and every person is motivated by some things some of the time. Benchmarking is a systematic method for comparing all aspects of your operation to the best-in-class. The team leader must recognize that the competition is constantly improving, and to stay ahead it is necessary to get out in front. This means a continuing reliance on change and the search for best practices. This may not be popular but is necessary. And the team leader must be willing to stay the course during the benchmarking process.